Look no further, you've found the Factory Microphone for the Magnum 257 high end 10 meter radio. Fits the RF Limited Magnum 257 and 357 radios. The 6 pin microphone affords direct plug in compatibility with your RF Limited two-way radio. 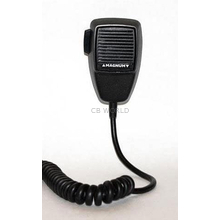 The coiled 6 foot cord is just the right length for most radio uses. With volume up and down controls on the front for the mic, you have sound control right at your fingertips. A Factory replacement microphone won't leave you guessing if it's going to work. You know when you open the package you'll be on the air in no time! If we are out of stock on this item, you can use an adapter, the C4PDF6, and get a standard 4 pin mic like these: 636L Series or CA73 or KCBMIC.